Justin's Closes; What Will You Remember?? Today's gloomy weather seems quite appropriate for this morning's sad news. Another celebrity-owned restaurant in Atlanta bites the dust. 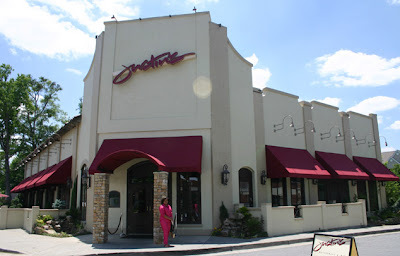 Right in the middle of ATL Bite Life's Soul Food Month, popular Buckhead eatery Justin's has decided to close its' doors permanently. It was pretty obvious to anyone who was ever halfway a regular here that the clientele had began to wane over the years. However, it seemed, at least to me, that Justin's would always find a way to be one of the few urban mainstays within the upscale Buckhead district. Honestly, I hate to see it go. Justin's is one of the last remnants of an era where Atlanta truly earned its' "Black Hollywood" moniker. Yes, many folks will only remember hit or miss soul food dishes and the infamous stories of Bobby Brown's nephew being stabbed by Baby Bleu back in '05 or when Tony Austin got shot in the parking lot during BET Weekend in 2010. But, to only tell that side does Justin's AND Atlanta a disservice. I remember when Sunday brunch at Justin's was poppin! I remember doing some of the best networking of my life at Justin's on Mondays. I remember not recognizing Kim Porter (Diddy's baby mama) and carrying on a long conversation with her at one of the 3BG parties. I remember Core DJ Weekend in 2009 when Diddy's Bad Boy label came down and bought food and drinks for all the DJs while Akon, Cassie, and Red Cafe hit the stage and my man DJ Quote rocked it. I remember a couple of Young Jeezy's private birthday parties. I mean, I really had some good times at this place!!! I guess I'll have to drown my sorrow in a bottle of Ciroc. So, today, spare me your stories of how your mac & cheese came out cold or how your service was slow. What was your BEST memory of Justin's?? I'd love to hear it. Leave your comments below or hit us on Facebook and tell us what you'll always remember about this place. You can also bid your farewell to Justin's either on Twitter - @justinsatl - or on the Justin's Facebook page.